Today we ride the rails. We purchase our tickets at a window in a building with high ceilings and tall chandeliers of wrought iron. Long wooden benches, smooth from years of use, sit in formation facing the ticket windows in expectation. There are two people ahead of us. We didn’t order our tickets online, we chose instead, the most appropriate way to buy train tickets. In recent years I have taken to the tracks more and more. I shared a sleeper car on an Indian train. Twice. Accepting chai from a bucket carried by a shoeless man. I have handed my bags over to red-coated porters at the bottom of a mountain of stairs for 300 rupees. In Italy I hoisted my 50 pound suitcase onto a high-speed train to make it to Venice in 2 hours, not six, sitting with travelers who happened to live not 10 miles from my home town. 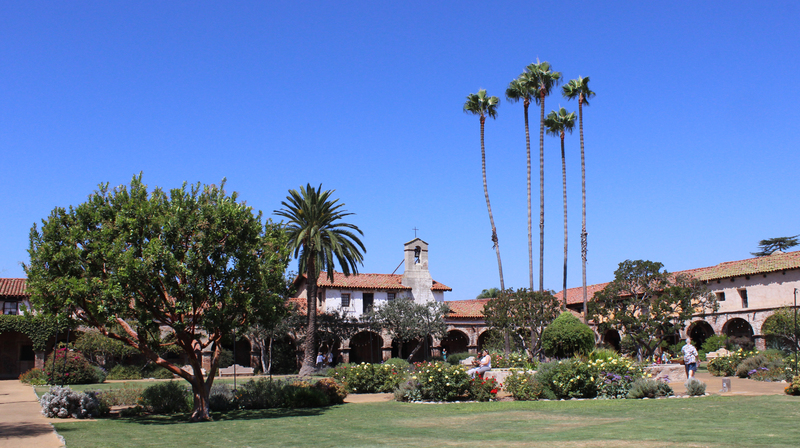 Today we are headed south to San Juan Capistrano on Amtrak. My niece has never been on a train before so it’s fun to get excited all over again about train travel. We cross the tracks to the south side and wait. A freight train shimmies by. The northbound train grinds to a halt. We wait, ours is coming. Finally in the distance we notice a flickering light that begins to grow brighter and larger by the second. It is our iron horse. We board and find our seats upstairs. She is glued to the window. When we start to move her eyes get big and she looks at us as if we just told her unicorns were real. A few stops and 40 minutes later we are at our destination. The quaint town of San Juan Capistrano. 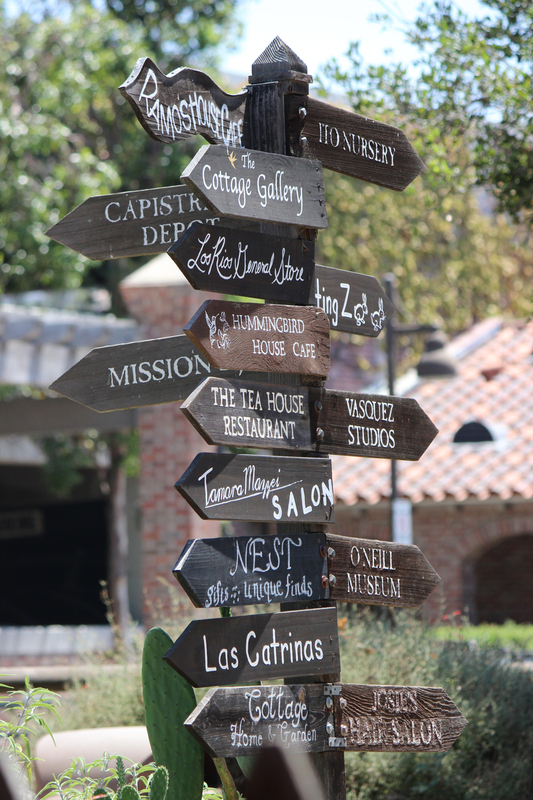 On our list today are: lunch, ice cream, wandering and the mission. Probably in that order. As we exit the train we are greeted by a bricked courtyard leading to shops and restaurants. A lone saxophonist plays for lunch money. People are stalled, waiting for a nudge of inspiration on which way to turn first. We decide to go up the hill toward the mission in search of a restaurant with grilled cheese sandwiches. On our way we pass an old movie theater with a tall marquee declaring it The Regency. Arched wooden doorways open onto what I can only imagine to be a red carpeted lobby with an ornate ceiling. Perhaps they still employ ushers that actually walk you to your seat. Now showing are Mission Impossible and Straight Out of Compton. Nostalgic bubble burst. Our hunt for grilled cheese takes us back down to the train and across the tracks to a canopied street dotted with houses that are now home to shops, galleries and restaurants. And a salon, if you need that. We line up to sit outside at the Hummingbird Cafe. My niece and I follow a few butterflies across the street to a garden while my brother waits for our table. Seated on the front porch we are afforded a view of the train station which is quiet while we eat. As soon as our check arrives the next wave of wanderers is delivered to the station. We watch as the train slides into view. There is a petting zoo. How could we not go to the petting zoo? It is on our little canopied street so we head in that direction. My niece is not so into it. She’s 7 in a week and really ice cream is more her jam. We linger outside the llama and alpaca stalls anyway. They cannot help but be funny. Close by are a couple of well-fed spotted pigs, a bored ostrich and a couple of donkeys. There are many more animals inside, but, ice cream. First a few shops and galleries on our way to ice cream and ultimately the mission. As we make our way back up the hill by the movie theater we find the ice cream shop. Every town has to have one, right? This one boasts gelato and frozen yogurt. As we enter I share with my brother that the gelato is not real, it is likely made from powder or some mix. I am an expert now that I have been to Rome. Of the 10 frozen yogurt bays only two are working and they’re sugar-free and fat-free. What is the point, I ask you? We leave. There’s some minimal whining, but she does not want sugar-free. The toppings bar tugs at her a little but she is strong. We soldier on. No luck. A Yelp search and a phone call later we are no closer to real ice cream. We head toward the mission with a promise to find her the perfect scoop today, somewhere, later. She’s strong. I love missions. This particular one was my first, nearly 30 years ago. I remember it as sparse with vibrant flowers and a few bell towers. We stand in line behind a man with a backpack of opened zipper pouches and canvases and sketch books under one arm. He’s here to capture the magic on paper somehow. With our tickets and map in hand we walk out into the open air of the mission. We take it all in then decide to start at one end and see what happens. In one corner kids are making adobe bricks, at every other corner and under archways and shady trees is an artist. Some are standing, some have brought chairs, but they are all painting. My niece befriends them all, inquiring about their work. She too is an artist so they have much to discuss. I walk slowly with my camera at the ready. Arcaded walkways, rounded bell towers, old stone work all call to me, but the elevated koi pond stuffed with lotus flowers in every color speaks the loudest. I spend a good bit of time here both photographing the flowers and watching the giant golden catfish we call koi. They are some of the biggest I’ve seen. Sticking my finger in the water, one rises above the surface to investigate. With an open mouth he searches for food, when he finds none he simply resubmerges. Relaxing and beautiful. Further investigation of the grounds yields a beautiful old chapel. Two, actually. One large by one hundred year old standards and another small intimate one. I explain the holy water and candles to my niece as best as I can being a non-catholic. She nods and moves on. It’s peaceful and cool in here. Reverent. I love visiting churches, temples and chapels when I travel. It seems no matter what is going on outside, there is a peacefulness that allows both internal and external stillness. I linger another moment. It’s time for ice cream. She has been distracted long enough and now she is ready. We learn there is a place called Ruby’s that has old-fashioned milkshakes and that seems to please her. But I have found more flowers and bell towers and ponds so I send them on ahead. I will do the power photography tour. That is, until I spot a hummingbird. I know their sound now. First I hear his chirp, then I spot him as he flits into a tree. I stalk. I struggle to change lenses quickly and efficiently keeping one eye on him. Please let me take your photo. Done, I look up and he’s calmly taken a spot on a branch where he’ll stay as long as I would like to capture his likeness. I move under him and around him. I step on a bench to get a closer look and he leaves. But not until I had taken at least 20 shots. Hopefully one will be clear. It’s time to meet my fellow travelers then head back to the train. They are upstairs in an old-fashioned soda shop, seated at the counter. A hand dipped milkshake in front of one and an ice cream sundae in front of the other. Back at the tracks we await our northbound train. It’s been a great day. We plop into seats on the upper floor again like we do this every day. I lean back and imagine taking a train across the country. Stopping to get off wherever I want. Wandering then getting back on. I wonder if they have lockers at train stations where luggage can be stored for just such an occasion. I make a mental note to check into it. Do they still have sleeper cars? Can you get a full, fancy meal? I let these questions hang unanswered as I gaze out the window watching southern California float by.